A successful build will start out with a plan; now, whether it stays on that plan isn’t always a guarantee. Lang Paciulli from LPRacing wanted to build a car that looked good, packed some punch under the hood, and was different than what normally see — so he built a beautiful 1966 Dodge Coronet. This Dodge runs as good as it looks with a Pro Line Racing-built Mopar engine under the hood. Paciulli is part of a multi-generational car family that has been modifying anything with wheels for decades. Being in the body-work business as a family it was all about making everything they touched look amazing, which is fine for some, but Paciulli was getting bored following his family’s path. Like so many before him, Paciulli wanted to squeeze as much power out of his 1972 Camaro as possible. 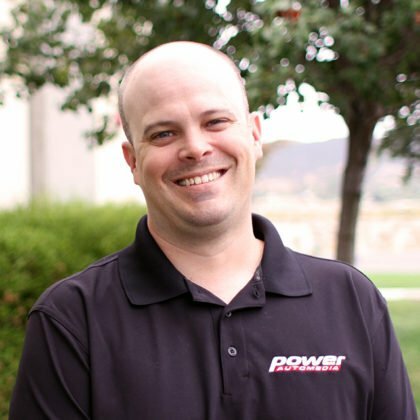 In high school, Paciulli worked at a shop with a crew of guys that were into newer muscle cars and drag racing. After a little bit of peer pressure, they got him to take his Camaro to the track and the outcome was a little less than stellar. 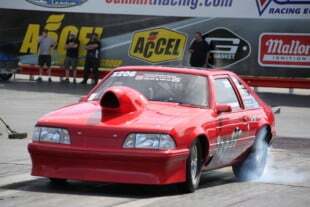 After lighting the boards with a string of 9.80s in the 1/8-mile, Paciulli got motivated to add some performance to his car. Soon, he was redoing the engine, drivetrain, adding nitrous, and bolting up some slicks. Paciulli’s was ready to head back to the track and earn some redemption with his Camaro — this resulted in an attitude change in how he viewed cars and performance. 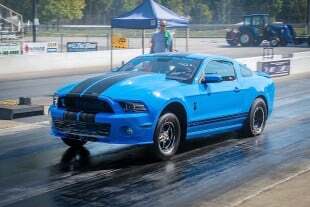 “My boss wanted to make me feel bad so he somehow got in the staging lanes and ended up running me in the other lane and that was the first time using nitrous. I ended up running a low 11 to his 12.0 and I was hooked worse than a drug addict. After that, anything I owned was stuck in primer and only adding power mattered,” Paciulli says. Paciulli started building cars on the side as he worked as a CNC machinist until he decided one day to leave his job to start his own business. At 19 years old he began building cars as a profession and 16 years later he still creates cars packed with craftsmanship. The Coronet and Paciulli actually have a long history together dating all the way back to his teenage years. When the opportunity arose to turn the car into something amazing, Paciulli jumped at it. “The car actually belonged to a friend in high school and once I started my business he asked me about building it. After a while, he lost interest and went over to the trophy truck world and the car sat for a long time. 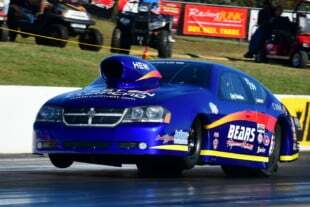 A few more years went by and a previous customer, Rich Mehas, helped fund and build the car to promote LPRacing’s capabilities. He let us do pretty much whatever we wanted with it. The car changed ideas and shapes multiple times until the final vision stuck,” Paciulli says. Since the Dodge was being built to compete at Drag Week originally, Paciulli opted to make sure the car would have plenty of power. Keeping the car all-Mopar, he went to Pro Line Racing to have them create a 540 cubic-inch mill. 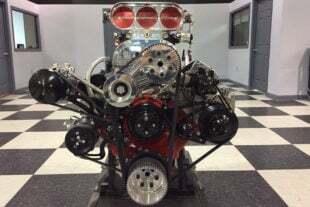 Inside the engine is a Bryant crank, Diamond pistons, and BME aluminum connecting rods. The INDY cylinder heads were built by Pro Line and filled with Manley valves and outfitted with a T&D Machine Products shaft rocker arm system. Induction comes from an INDY Dominator intake manifold and 1000 cfm Holley dominator blow-through carburetor. Fuel is provided by an Aeromotive A1000 and Waterman Mini Bertha fuel pump. An MSD Billet distributor and coil create the spark while working with a Power Grid system. A pair of Precision GT4788 turbos breathe through a custom turbo system from LPRacing. A set of Turbosmart wastegates and blow-off valves keep the boost in check as it flows through the LPRacing-built air-to-air intercooler. Behind all of this is a Rossler Transmissions TH400 and ProTorque torque converter to transfer the power. The chassis features a custom suspension built by LPRacing from front to back. Inside the rearend are parts from Mark Williams Enterprises and all of the dampening duties are handled by AFCO shocks. Wilwood brakes are at all four corners along with RC Components wheels in the front and Champion double beadlock wheels in the rear that are covered in Mickey Thompson rubber. Most people will look at the Coronet and not realize how extensive the body has been modified under the Corvette ZR1 shade of blue. The drip rails have been removed, the cowl was replaced, it has flush-mounted windows, custom bumpers, and massaged wheelwells, just to name a few of the changes made to the stock body. LPRacing also made their own custom carbon-fiber hood to keep the big Pro Line engine and turbos hidden from view. Paciulli wanted the Coronet to drive as good as it looks while having plenty of performance. The final product is a car that checks every box he laid out when the build was started. “Originally, this was going to be a Drag Week car but now that it’s done and the way the classes have changed it will probably just be run locally. The car is very comfortable to drive and it cruises along like a brand new vehicle on the street. 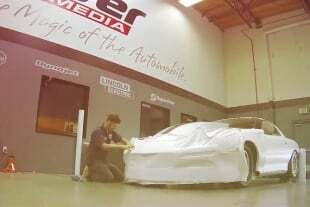 Once it makes all of its rounds on the show car circuit it will be going to the track for a lot of racing,” Paciulli says. The Dodge Coronet that Lang Paciulli has created is a head-turning ride for all of the right reasons. You don’t see many, if any, Coronets built to this level and that’s what makes it so unique. Paciulli poured generations of knowledge learned into this Mopar and it is just overflowing with good looks and horsepower.